Portfolio management is good. Working with vendors/others that use Microsoft project is not. Also difficult when developers use other systems for tasks and time reporting. People do not want to duplicate efforts, and that makes team members resistant to using the system for updates on what they are doing. We are a marketing department within a software company. 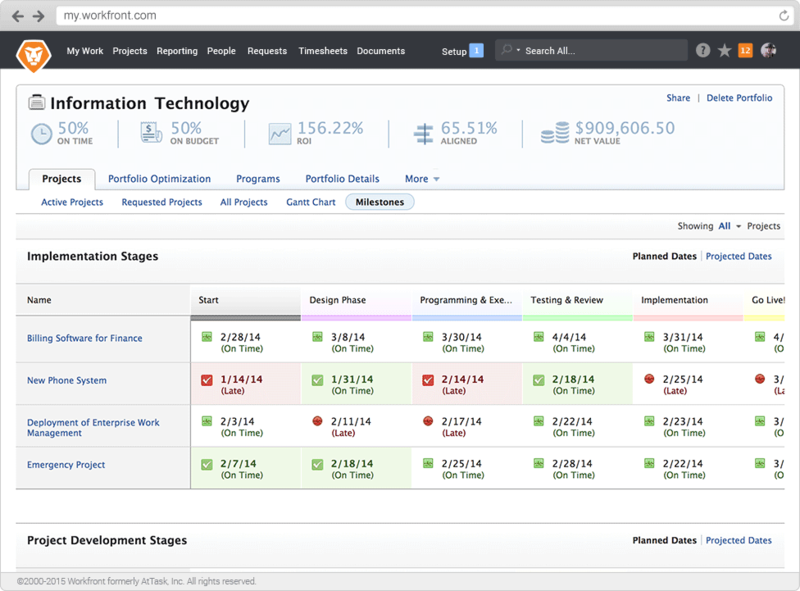 We use Workfront to manage all projects. It allows us to manage resources, timelines, tasks and report on volume of work moving through the department. It is a great way to capture updates and files in one place and provides transparency to everyone on the project. Capturing project updates. All dialogue can be housed in Workfront, eliminating the need to hunt through emails. Workfront offers flexibility in managing updates with integrations such as Slack. Users like to customize the inflow of messages in different ways yet the data stays within the system. Reporting. After you use Workfront long enough to build a database - the reporting functionality is very helpful for presentations. Everything from time spent and volume of work to adding resources. Proofing Tool. Being able to share proofs with multiple users with them seeing each others' comments saves a lot of time. And the changes are captured all in one place. No more laser proofs! I'd like an easy way to create a custom calendar for my team. Workfront is helping me build a solution but I imagine this is something other users would also like. That being said, Workfront does provide a way to submit ideas for future releases, which is great. Some of the training materials (in the extensive training library) are out of date. With updates happening a few times a year, it is important to remove information that is no longer accurate. Leap - invite prospects to your great conference! Workfront is a great tool for marketing, customer success, and (internal or stand alone) agencies. I haven't used it in other situations but it would work well for any company that has to manage projects, especially across remote teams. It is flexible enough to work with small and large projects, and any size company. User Review: "Bloomberg Loves Workfront"
We currently have 2 instances at Bloomberg: Marketing and Media. I represent Marketing. We predominantly on-boarded Workfront for our internal creative studio, but we are working to move the rest of Marketing on when the budget allows. It would effectively double our license count so its a bit cost prohibitive at this early stage in our Workfront relationship (we launched in July 2017). The administration is easy, and if I can't figure it out for my users, the Help team can and does it quickly. I'd like a better organization of reports and dashboards. We have way too many reports right now, which is our own issue, but... finding the right one is a challenge. I think there is a stigma that you cannot force a process on creativity. But the reality is it can enable it. I'd like to know we have a partner in Workfront that is not purely tool based, but help us prove the value proposed to users and stakeholders... help us convince them that following basic procedures is valuable to them and the bigger picture. Review: "Workfront is the best project management system on the market"
I like the intuitiveness and ease of use with the system. It's easy to train new team members and show them around the system. It makes my job easier on a daily basis for sure. I don't like that when there is something broken or not working in the system, it takes longer than I feel it should to get fixed. Reports are sometimes hard to build because the system is so large. We get a system that keeps everyone organized and up to date on the hundreds of projects we have in progress on a daily basis. That's what Workfront is best suited for. I honestly cannot think of any scenarios where it's less appropriate in my company and organization. It fits our needs perfectly. User Review: "Workfront Leaps Ahead"
Ability to decide what kind and how many notifications to receive. Being able to create a multitude of reports (e.g. intake, tasks, how many requests and by who). Online training (Ascent) and resources to answer most questions. Local communities (go Mid-Atlantic user group!) which offer an opportunity to collaborate with other system admins, workers and users. Support has been very good. If we don't get a good resolution via email, we can either Skype or have a conversation. Usually resolve issues within 48 hours. IF it needs to be escalated, our customer rep is always on it. Would be helpful to be able to respond to an email from someone, generated in Workfront, and have it captured on the project. See all updates regardless of where they are (e.g. project, task, proof) show up in the update feed. We are in in-house MarCom group (Creative, Video, Web, Comms, Advertising, Image Center). Workfront has helped streamline our project intake by making it manageable. Workfront provides a transparency for us that was lacking. All team members used to work in silos. Now we can all see what each is doing and we know what the workload is for the team. Workfront proofing has changed things for us - we no longer have to search through emails for feedback, nor is there any question as to what the reviewer wants changed. We wanted better proofing capabilities - the ability to proof several documents at once, automated workflow approvals. That is here! Workfront is well-suited to just about any project. It's customizable for all departments and offers numerous integration with software you may already be using. User Review: "Workfront really works"
WorkFront is slowing taking over all of the teams within the company. It started with just the marketing teams and slowly migrating to many other facets. As we add more people into the same system, we are able to get more visibility to what's coming as well as a better understanding of the company as a whole. Many teams are silo'd and this program breaks those barriers. WorkFront has a great support staff that is always there to be a sounding board or provide best practices. 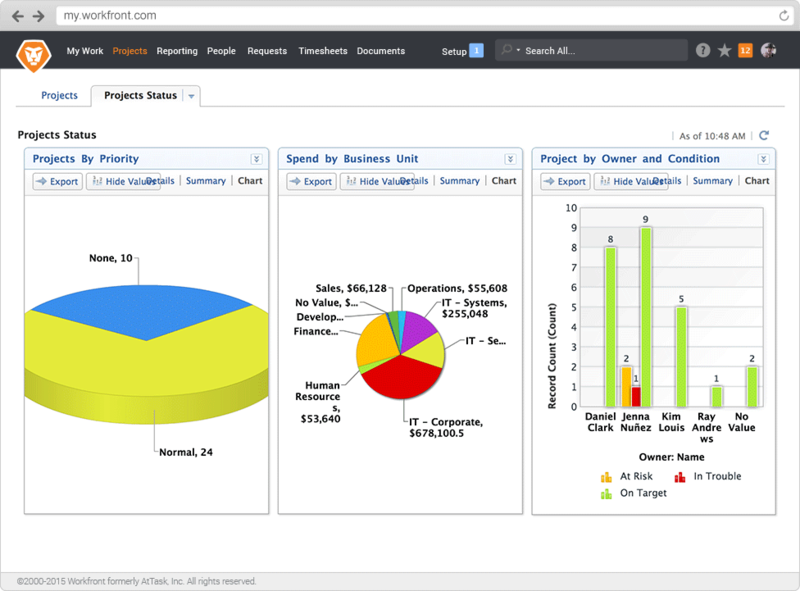 Workfront is great with managing projects and creating robust reports. We are able to track 4k+ projects a year with the system and not spend hours a week making reports. You set it and forget it. They can even be scheduled to email out to those who need them. Workfront manages all of the tasks necessary to complete a project and can house the approvals and back and forth conversations. With one link you can see the entire life of the project. WorkFront is so robust that you can dive too deep to fast and end up "breaking" the system for others. Be sure to limit access levels BEFORE you add people to the system. Workfront is great at taking all the crazy information that you get from multiple sources and putting it into one digestable form. However you need to have a strong understanding of your team and workflows before you being implementation. If not you will end up making a tool that no one wants to use or understands. User Review: "A quick look at Workfront"
Project and executive level reporting including dashboards. Providing a centralized 1 version of the truth for projects and portfolios. Resource management and forecasting are areas that are currently being improved. I look forward to working with the newer versions. Workfront is well suited to an organization that needs a Project and Portfolio Office where data sharing and executive level communication is key. As an organization, you need to have a vision of where you want to go . . . Workfront has many options that can support a variety of approaches. Review: "New Workfront Implementation experience"
Many departments utilize Workfront at Prudential, but not the entire enterprise. It addresses the problems of tracking and reporting out on work being done within our Communications team. It plans for the future and provides insight into projects that are completed regularly. It keeps daily tasks in front of the users. It allows for document upload and approvals. Well suited for larger teams in multiple locations. Review: "Workfront is an awesome tool that the entire company can use"
I think that Workfront is beneficial for projects. I don't think that it would serve as a good help desk tool. 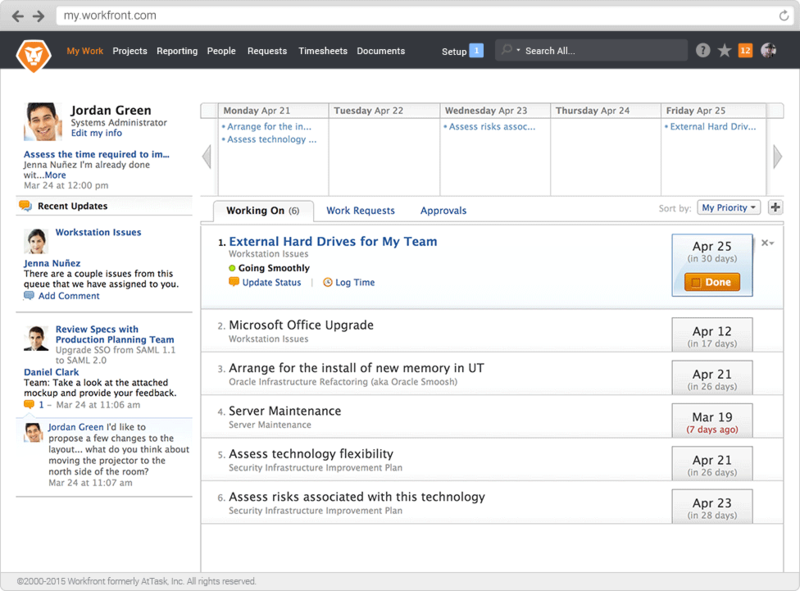 User Review: "Workfront Work Managenent"
It does a great job of providing a view of all project info in a single place. User Review: "Workfront is a Game Changer!" Organizes documents, comments and approvals all in one place! Cut back on the clicks. 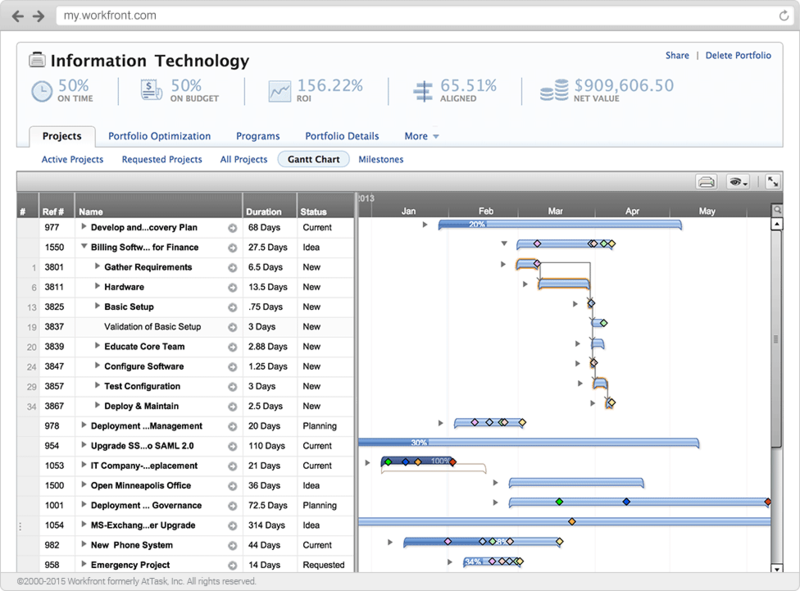 Workfront is a great tool to organize and track approvals on projects. Workfront Review: "Overall Super Satisfied"
[It] needs to be more streamlined. Review: "Workfront is amazing---couldn't live without it!!!" We implemented Workfront across our Marketing & Communications department and were solving for a lack of a project management tool. We are also planning on potentially rolling out their collaboration capabilities across our healthcare organization from a requestor standpoint. Workfront has been great so far and they continue to implement new features and revisit and improve existing ones. Corrals all the work in a central place. Update feeds allow for a real time communication tool, keeping you apprised of the most current project updates. Their support team is fantastic! I was receiving too many email notifications but they realized that this was a common issue and were quick to resolve it. Workfront works well for our healthcare system marketing & communications department. User Review: "Workfront gives us the data we need"
We are the in-house creative services team, so Workfront's approval workflows and digital proofing tool were incredibly appealing. In the beginning, it's a little overwhelming... so user adoption is tough. User Review: "Workfront is amazing -- a must have!" Allows for a high level of customization. This lets me make Workfront what I need it to be for my company. Highly customizable notification system and resource management tools. I can get all the notifications that I need, when I need them, where I need them. Integrated proofing tool with automated review and approval workflows. Revolutionizes how we handle proofing and approvals. Customer support could be stronger. Had an issue and the rep was very kind and respectful, but I ultimately had to find the solution to my problem myself. I think that this is getting better, however. In the creative realm, it is extremely well-suited. I can't really speak to other departments or teams, but based on the level of customization, I have no doubt that Workfront would be MORE THAN sufficient. The ability to scale the system up as our company scales is one of the best things for our organization. Workfront might be too big for simple project management of unrelated projects with a low number of stakeholders. Workfront Review: "Cool Project Management Tool"
Workfront Review: "Excellent Team Collaboration Platform"
Communication: Workfront provides multiple team communication tools including email integration. Ease of Use: The Workfront platform, although rich in features, is very easy to navigate and users will find its layout highly intuitive. Instant messaging and IM systems integration such as Skype would be an excellent addition. Browser plugins to streamline research tasks. Multi systems alerts for "All Hands on Deck" type situations regarding project management. I work on a team where each of us is separated individually from the United States. Workfront enables us to collectively collaborate on a common project setting individual goals. Project managers can invite users, send out updates and set goals to be marked as complete by individual users. Definitely an AAA+ option for global team project collaborations. Smaller projects with fewer working participants would most likely not benefit from the ROI for this product, however, if these smaller tasks are building to a larger project or your teams have multiple small projects running simultaneously then Workfront is for you as well. Review: "Workfront: a tool to save the R&D manager in the daily work"
I don't suggest it for a small team working on a project in series and/or frequent project scope/priority change. User Review: "Workfront Really Works!" WF enabled us to provide a complete culture shift when tracking marketing and design projects. We now have a place that captures as many details as needed to get a project started and worked through. It's been a great way to know the number of projects we're working on and accountability on all parts to maintain a timeline that respects everyone's needs. We pull reports that are able to show our board of directors the type of work we're doing and how we are doing it. We are able to have transparency between departments to have an understanding of everyone's needs, strengths, and deliverables. I'd like for us to be able to pull reports that are a bit more customized. For example, I want to pull a report that enables me to see what task went past due first to see where and how we can improve. That report currently exists but unfortunately, it pulls in every other task that is past due in the project...instead of me just being able to pinpoint where we start to lose time. I'd like to be able to "pin" documents and Updates within a Portfolio for easy reference when looking at a project as a whole. We would like an option to create a Kanban style storyboard. We use Workfront for a wide variety of project types. Everything from creative projects in marketing to application development. Workfront provides a broad set of functionality for project and task management, but each project and project manager can use as much of that functionality as they wish. Review: "Workfront from an IT perspective, function and support." The primary strength of Workfront is the feature that most IT professionals dread and that is its ability to do all things related to process and projects. The usual jack of all trades approach is often one of master of none but in the case of Workfront, given some time for customization to make the tool your own with the help of the Workfront team, those requirements for an all-encompassing application achieve the goal well. Not just functional but more concretely in providing real assistance in getting through workflows and processes with minimal effort. Multiple APIs allow need integration into the legacy systems and peripheral packages that all companies use for Microsoft products to smaller more niche applications. A very helpful attribute of the application. As with many service industries, time reporting is a huge resource drain when the tool for doing so is slow, complex or limited in scope. Workfront allows for access to all project data from within time management as well as simplified approval processes and review capabilities for managers of time and resources. While it seems like a minor feature, integrated search throughout the application makes life and time management much simpler with the ability to select data points from drop downs drilling down into every aspect of the app. Reporting, likewise, is extremely adaptable to the needs of various business functions with easy customization and granular capabilities requiring little in the way of training or skillset. Pros and cons shift inevitably based on what functions you perform. My own is that of support and as such my hammer and nail often revolves around issues and my ability to both deal with them in a time effective manner as well as automating what can be automated both on the front end in work flow as well as output in terms of process. The application functions well for the majority of level 1 and some level two issues surrounding almost all organizations but can be unwieldy when it comes to things like merging issues or creating global tickets. These are functions fairly unique to support applications but in that venue they are extremely important for both results and clarity. Larger scale items which I do not see as part of this type of package would include integration with more technical tools such as network discovery or heartbeat ability while not necessarily a normal consideration in an Enterprise application of this nature, would make it extremely attractive to those who have to support its use over its lifespan. On the upside and along these lines, Workfront can boast a large suite of APIs making the integration of packages outside of its borders such as legacy application from whom the org cannot disassociate easy and, with the help of Workfront personnel when needed, fairly straightforward. The management of resources and workflows is another of the strong suites of Workfront contributing to the smooth fulfillment of daily operations. "Honest Workfront review from somone who uses it all day long and is in the trenches and on the workfront"
Workfront contains al the necessary details and documents in one location for easy reference. Workfront allows anyone within the company to review a project and know exactly what has happened through the work on the project and also the current status so anyone can pick up the project and work on it if need be. The organization of types of billing is a great tool to be sure we charge appropriate rates for our time. Example: Wed hours are more expensive than studio/design work, so we are able to manage billing quicker and easier. It would be nice if Workfront allowed a 'middle' category between a project and a task, so we can have subtitles to projects. It would be great if Workfront could link to Outlook - our project orders come in through email, our project revisions come in through email, so we are always duplicating time in cutting and pasting each and every order or revision into Workfront system and then taking the update out of Workfront and pasting it in to an email, it would be great if that process could be streamlined. Managing the end date for the project is difficult, the project status can't be in "complete-pending approval" if we want to push the finish date out further, so we have to adjust the status for the project, change the date and put the status of the project back to it's original status - sometimes we forget to do that after changing the date and the project goes into a place where the proper staff doesn't see it to manage it. The rejection process is clunky. If the task is updated and then requires a rejection, it should carry forward the details from the update rather than requiring us to cut and paste the same information 2 times into both the update and the rejection. Workfront is well-suited for our ad agency business because projects can be outlined and managed appropriately through the necessary process. I could see Workfront working well for any business that utilizes a project management system and needs to stay organized. A developer in construction projects, or an interior designer could make use of this system nicely. Or a property management company could use the system to keep track of tenants and work orders, or a condo association for each unit's work issues or repair requests. 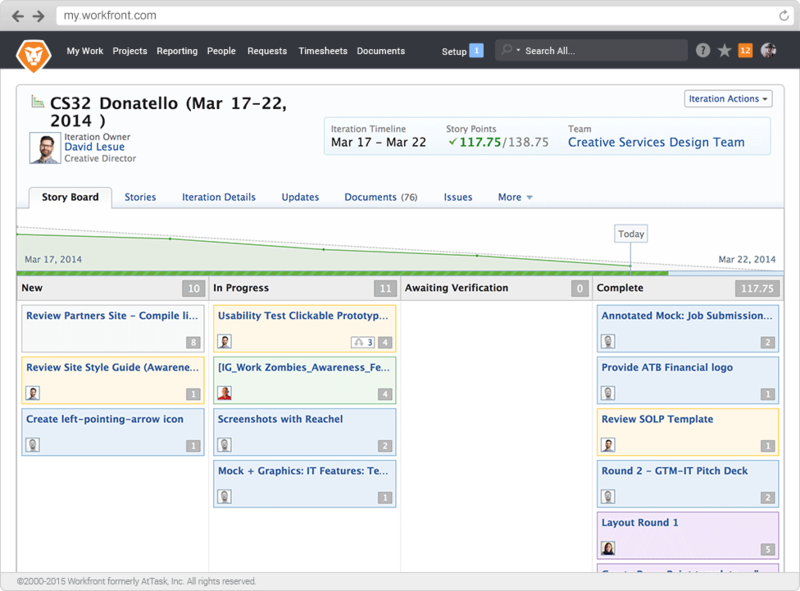 Workfront is a web-based project-management tool developed by Workfront, formerly AtTask, based in Utah. It was designed for both IT and marketing teams, but can be implemented for any kind of project. 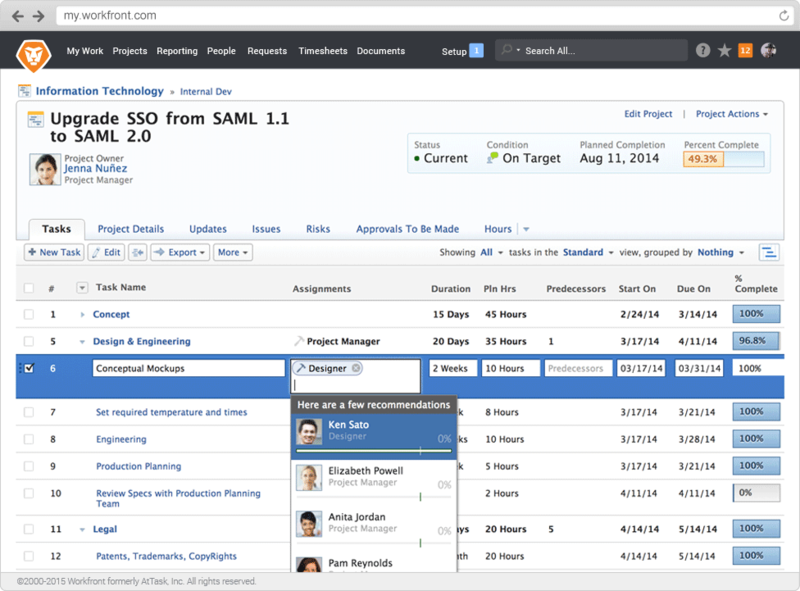 Workfront offers all the features standard to project management platforms. Editing and updating issues from the project view is styled to work somewhat similarly to a social networking site, bringing team members together in one central location. From the project view screen, issues, documents, and other elements of the project are placed along a tab bar so that they may be addressed with one click directly from the hub. The platform's Capacity Planner allows a manager to move resources to where they are needed, and has some automation features (e.g. the Set Best Fit option, which attempts to allocate resources optimally within given constraints). Agile project management is supported with features like Gantt charts, an easily viewable and manipulable backlog, and storyboarding. Team members can be managed with the aid of quantitative metrics that show where work would be best allocated. A free trial is available, after which Workfront comes in four pricing options. The lowest tier is Collaboration for small groups, followed by Work which adds mobile accessibility and time sheets, then Plan which adds additional analytic, planning, and reporting features. Finally, Enterprise Plus offers the highest configurability as well as support and data security.